Recipes like this have been floating around pinterest and the Paleo recipe blogs for quite some time and I have always wanted to try a version of it. Any recipe that features the mighty avocado is already a winner in my book! A mashed avocado provides the creamy base for this recipe and the addition of tomatoes, cilantro and chopped avocado take it to the top! You could add a tablespoon of Greek yogurt for additional creaminess if desired and I have seen chopped, cooked bacon added as well adding yet another flavor dimension. For the chicken you could use grilled, rotisserie, poached or baked chicken. To bake chicken breasts for this recipe I simply take about 3 medium chicken breasts and place in a 9×13 baking dish. I sprinkle with salt and pepper and a little drizzle of oil and bake at 375 for about 20-15 minutes, depending on the thickness of the chicken. Be sure to cool the chicken before adding to the recipe below. Peel one avocado and place it in a large bowl. Set the other avocado aside. Using a fork, mash the one avocado until creamy. Add the juice from two limes as well as a dash of salt, pepper and garlic powder. Mix well. Add the chicken, tomatoes, scallions and cilantro and toss to coat well. Taste and add additional salt and pepper as needed. Peel the second avocado and chop into small cubes. 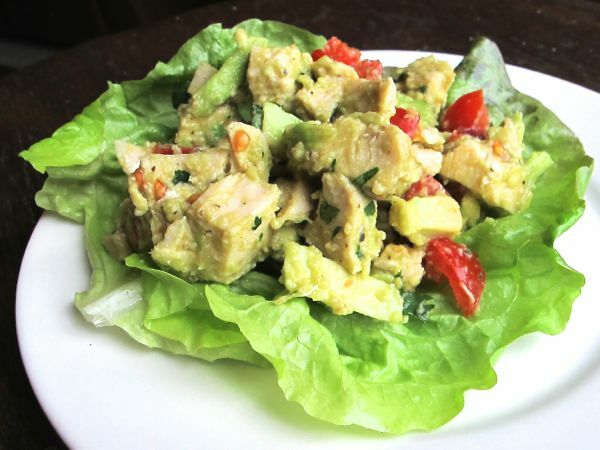 Toss the avocado gently with the salad mixture. Serve in Romaine lettuce boats or whole-wheat pita pockets grab and spoon and dive in!